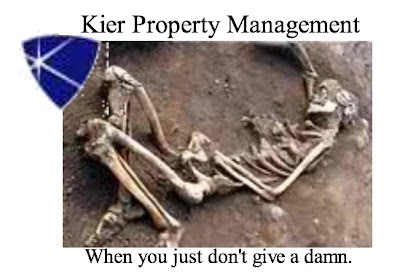 Kier Corp’s Crap: The destruction of a Landmark: Kier's Flagrant Waste of these Utilities....cost me THOU$AND$. The gas bills at this building had always been kind of a sore spot with me, because what I was told that the bills were during the sale, and what they actually turned out to be during the winter months, was not even in the same ball park.. It seems someone did a little fudging on the expense reports. 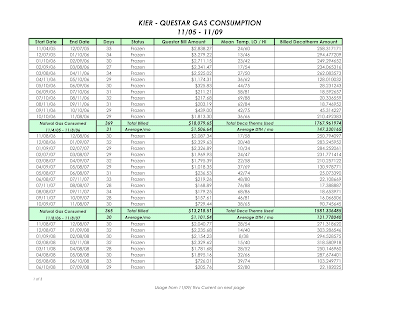 As you can see in the chart below, during the winter months the gas bills for this building were outrageously high, ranging from $2-3 thousand dollars per month and more. 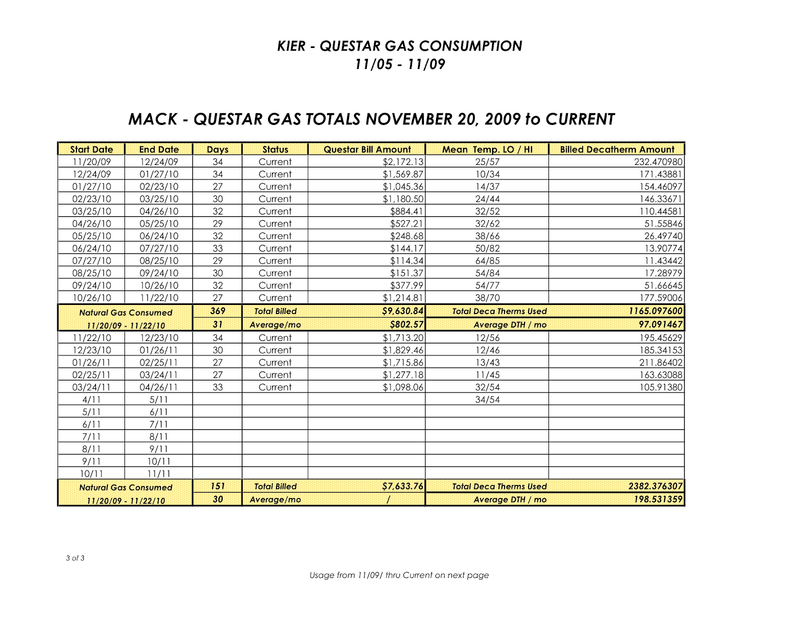 I was consistently after Kier about the ever rising gas bill, but the only answer they could come up with, was to ask HUD for a special utility increase to pay the higher bills... (which I now know, is something you can't even do) Of course, these "special increases" never materialized and it was back to the $3,000 gas bills once again. 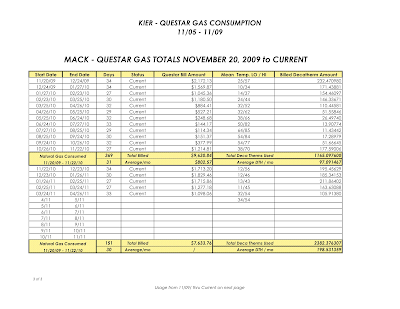 The chart below contains data provided to me by Questar Gas, for the gas bills at the building from Nov. 2005 thru Nov. 2009. 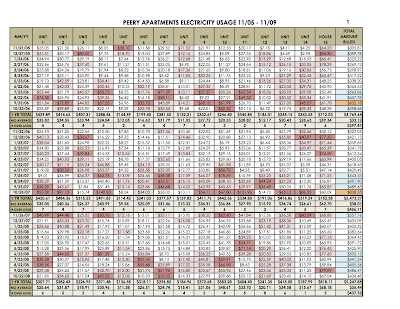 You can enlarge any of the charts by clicking on them. 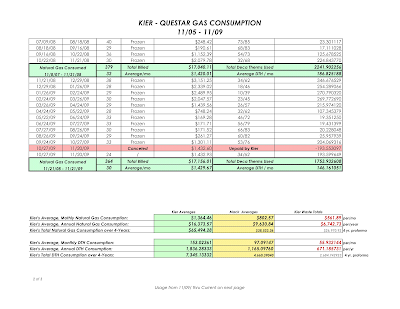 These charts clearly demonstrate that, not only was Kier consistently flushing over $6,700 of my money down the toilet every year,.... They were also wasting our natural resources, by the truck load. that could be done about these ridiculously high gas bills. in just the first year alone. According to the tenants, Kier would routinely start up the boiler at the first sign of cold weather in the fall, and would leave it running 24/7, whether it was needed or not, until well after the weather warmed up in the spring and they got around to shutting it down again. 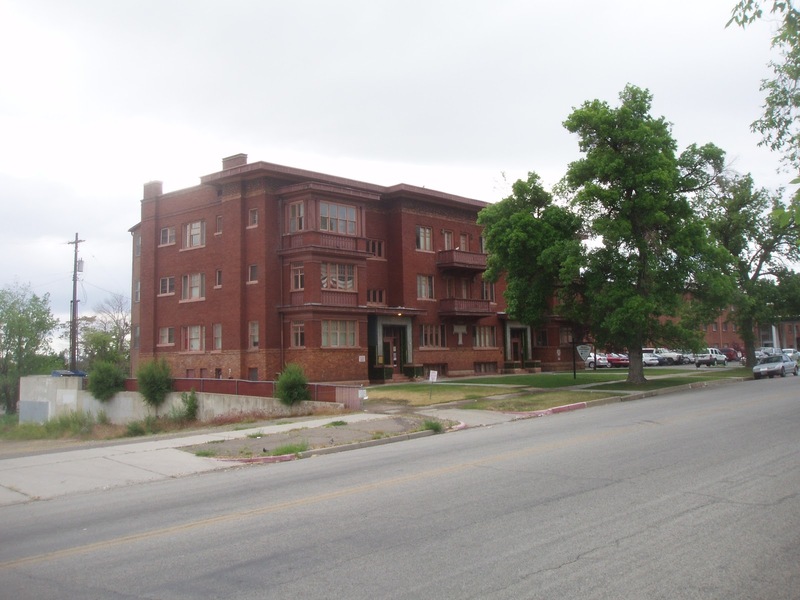 In the beginning, I made a couple of surprise visits to the building in the winter time and I was stunned to see that almost every tenant had their windows standing wide open, while temperatures outside were hovering in the 20's, or below. when you have the owner's check-book... right? See what Kier came up with here and here too. As long as they don't have to pay for it too. Kier wasted water.... They wasted A LOT of water.... In fact, the amount of water that Kier wasted in just 2009 alone, could have filled more than 10 swimming pools.... with a couple of good sized wading pools left over. 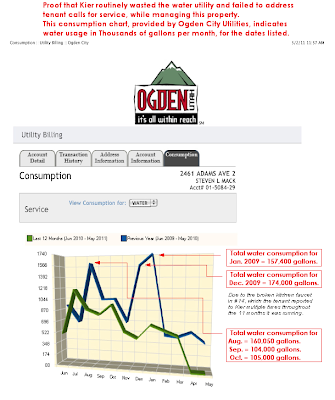 I downloaded these charts from the Ogden City Utilities website. 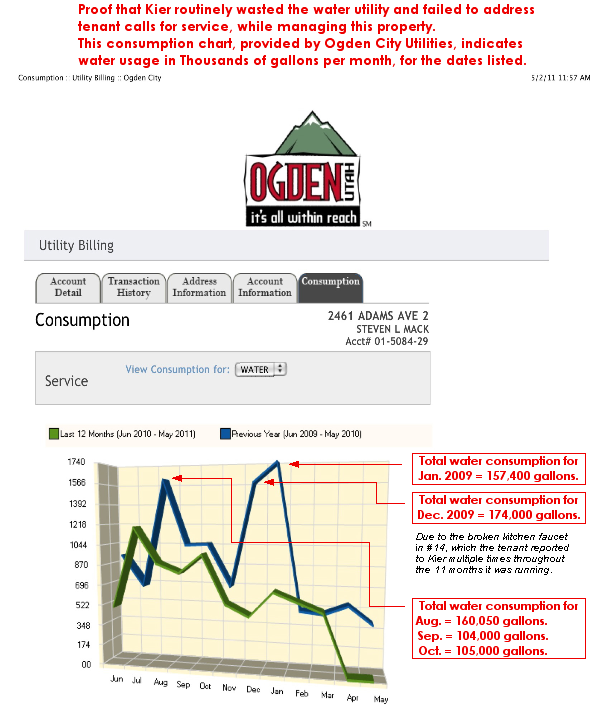 The chart above, measures water consumption in hundreds of gallons. 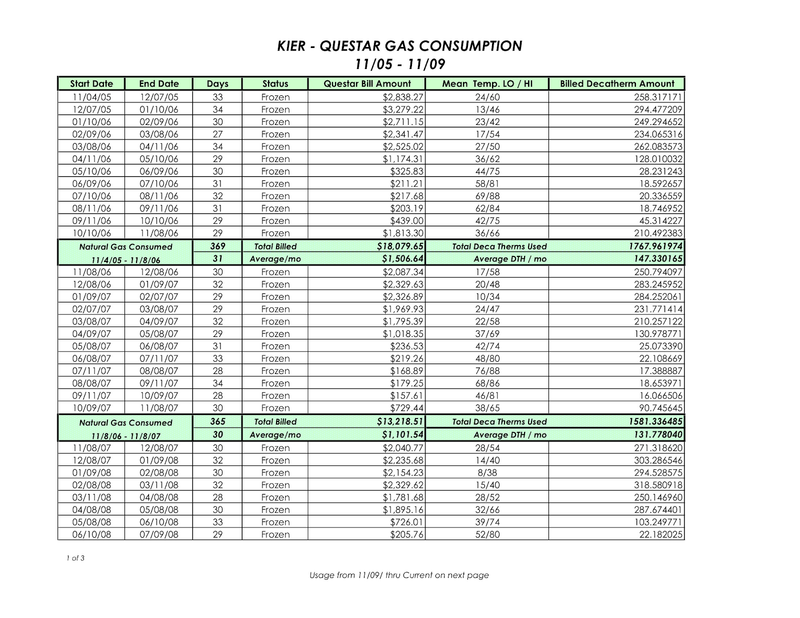 For instance, Kier's water consumption for the month of August 2009 was 160,500 gallons. 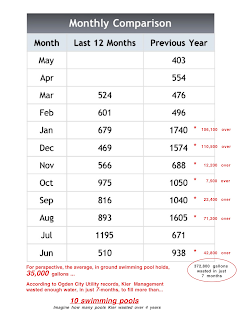 compared that to just 89,300 gallons in August 2010, under the current management. That's a reduction of over 71,000 gallons. To put that number into perspective. 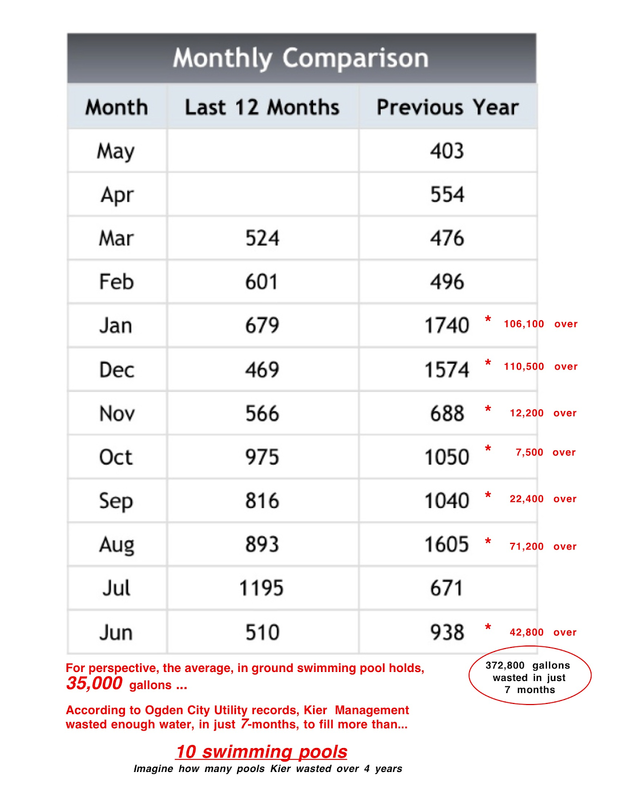 The average in-ground swimming pool holds about 35,000 gallons of water. 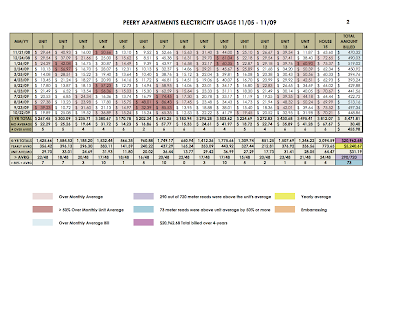 In August 2009, Kier wasted enough water to fill 2 swimming pools and still have some water left over. 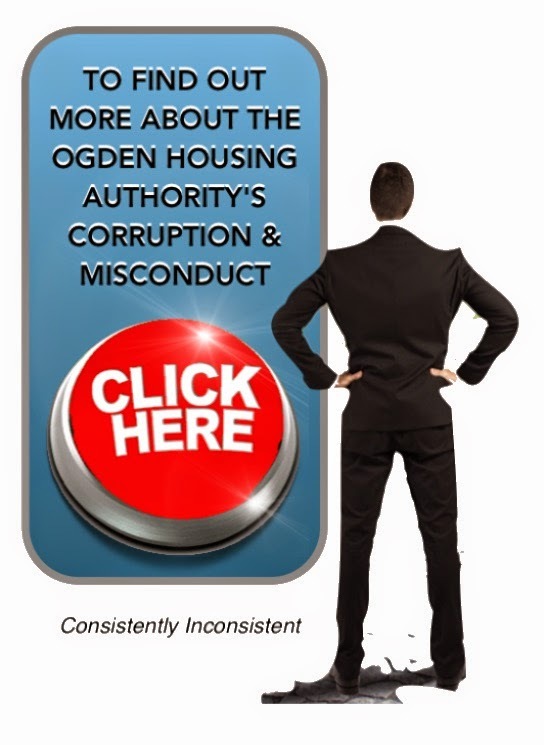 Of course, under the current management, we didn't have a unit with a kitchen faucet that was stuck in the full-on position for almost 13 months... because when the tenant told US about it, WE FIXED IT. This is billing data that was provided by Rocky Mountain Power. 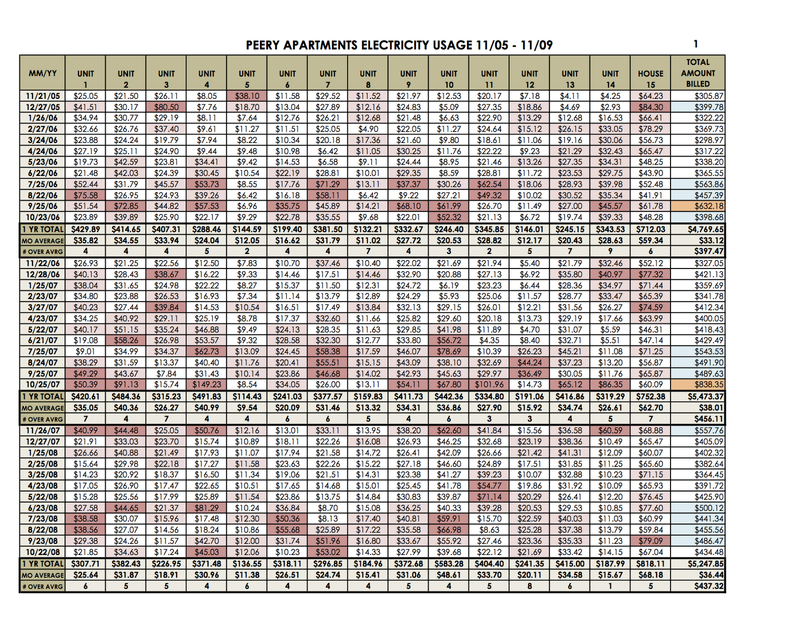 In total, 290 of 720 meter reads were well above the unit's average and 73 meter reads were over 50% higher than the unit's average, yet this data never raised a red flag for Kier. 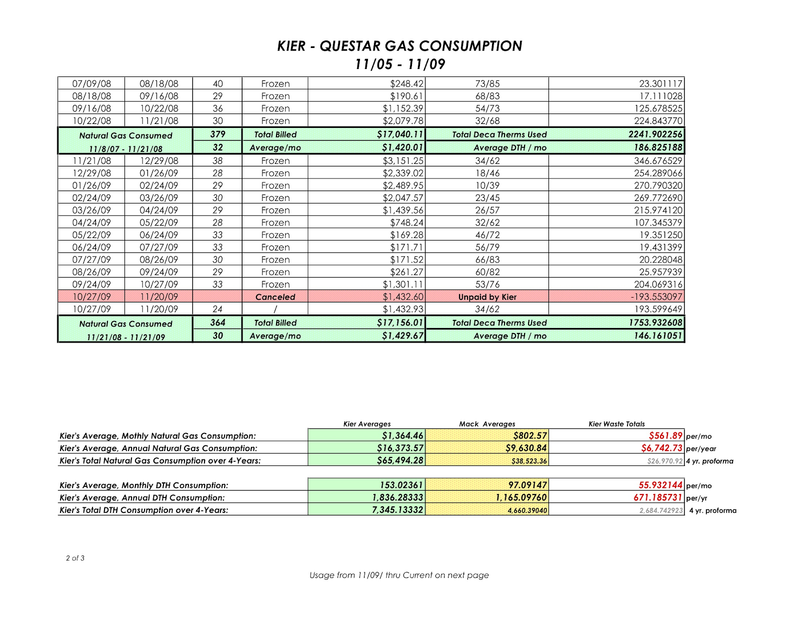 Most likely because Kier never looked at this data, they just paid the bill... with my money. When I took the building over from Kier, I discovered an electrical timer box in the basement, with a padlock on it. Since Kier failed to give me the key to this lock, I had to cut it off. What I found inside the box can only be described as the epitome of Kier's negligence and their gross mismanagement of this building. The timer inside the box, controlled ALL of the building's interior and exterior lighting. The pin that shuts the timer off, had fallen off and was laying on the bottom of the box. ALL of the building's common area lighting and exterior / security lighting was left on, 24/7/365. Bulbs for the building's lighting cost $12 / each and the building has upwards of 29 interior and exterior light fixtures. The average life expectancy for these bulbs, under normal use, is around 8 - 10 months. Under constant usage, that life expectancy is reduced to just 5-8 months. 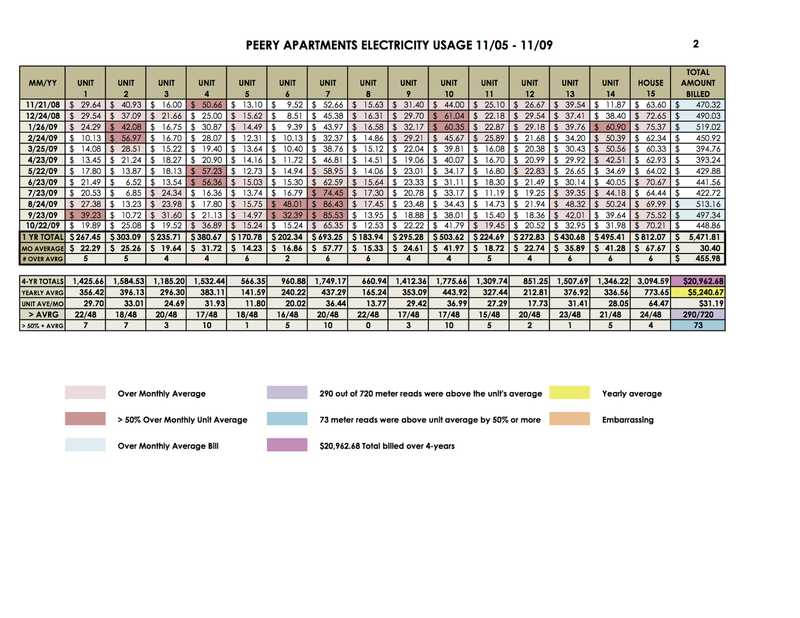 Add in the cost of the electricity and Kier's negligence and mismanagement ended up wasting A LOT of money for me. I put the pin back on the timer wheel, and instantly reduced electricity consumption at the building by nearly 50%. In all that time, Kier claimed to have had a number of employees at the building on a daily basis, yet not a single one of them ever noticed that these lights were on during the day?? VERY observant of them, huh? 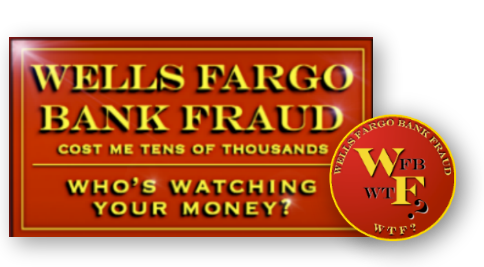 Almost as observant as their accounting personnel, who somehow missed the sudden jump in the electric bill every month. 2. Kier just didn't give a damn. Anyone care to take a guess at which one? During my initial, month long stay at the building in December 2009, I noticed that the trash truck came to empty the dumpster on a Wednesday. Just two days later, on the following Friday, with only one (1) bag of trash in the dumpster, Allied's truck came out and emptied the dumpster again. I contacted Allied Waste and was informed that Kier had scheduled the trash to be picked up twice a week, at a cost of $90 per pick-up, even though there was clearly no need for it. Still, I waited for another week, and then another week after that and it was always the same, week after week. The dumpster got emptied on Wednesday. Then just two days later, the near empty dumpster got emptied again. Again, I called Allied Waste and had the pick-up changed to once a week and reduced my trash bill $360. each and every month. The building continues on a once a week pick-up schedule, and aside from the handful of times when we were evicting some of the system abusing tenants that Kier rented to, the dumpster has NEVER been full.